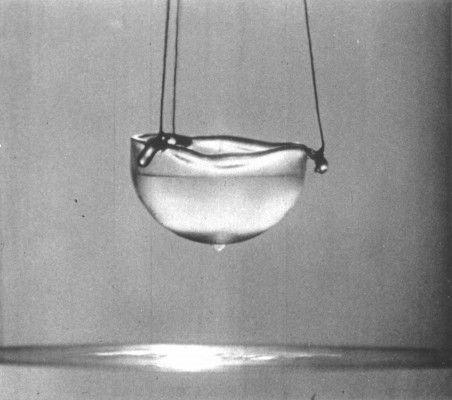 Superfluidity is a state of matter (like solid or gaseous) that occurs at extremely low temperatures, has high thermal conductivity (every ounce of it is always exactly the same temperature), and no viscosity. Helium 2 is the “most” example of this. A cup of He2 will spontaneously flow up and out of a container, as if it just decided to leave. It also seeps right through otherwise solid materials because its complete lack of friction allows it to flow through otherwise invisible holes that would not allow regular helium (or water for that matter) to flow through. He2 did not wind up at number 1 just because of its ability to act like it has a mind of its own, though, it is also the most efficient thermal conductor on earth; several hundred times that of copper. Heat moves so fast through Helium 2 that it moves in waves, like sound (and is fact known as “second sound”), rather than dispersion, where it simply transfers from one molecule to another. Incidentally, the forces governing He2’s ability to crawl walls is called “third sound”.